Robert VerBruggen does a nice job over at National Review of laying out the arguments for and against the assertion that the 14th Amendment mandates automatic citizenship at birth for the children of illegal aliens (and tourists, foreign students, visa workers, etc.). Even though he concludes that the Constitution does require it, he makes clear there are smart people who come to a different conclusion. I’m with Ramesh Ponnuru, who earlier this year counseled some humility in this often-contentious discussion: "Would it kill all these debaters to admit … that since there were no illegal immigrants in the United States at the time the amendment was adopted, nobody involved in the debate was thinking about how to treat their children? That applying it to these children is therefore a tricky interpretive question?" But the immediate issue is not the meaning of "subject to the jurisdiction" in the 14th Amendment, nor the merit of a policy of automatic citizenship at birth for the children of illegals and tourists. Instead, the question should be, how to get the Supreme Court to rule on this "tricky interpretive question," one way or the other? Neither the Court nor Congress nor any president has formally addressed this issue. Our current practice of awarding citizenship to anyone born here (including to children of diplomats, despite claims to the contrary) simply happened, without any decision that we should pursue such a policy. Forcing some kind of formal decision would be the point of any executive order on birthright citizenship. Andy McCarthy is skeptical of such a move, despite favoring a change in our citizenship policies, because he argues that it would be beyond the president's power. And he’s right if President Trump thinks he can simply decree that from this day forth, only children born here of citizens or legal residents are themselves citizens. 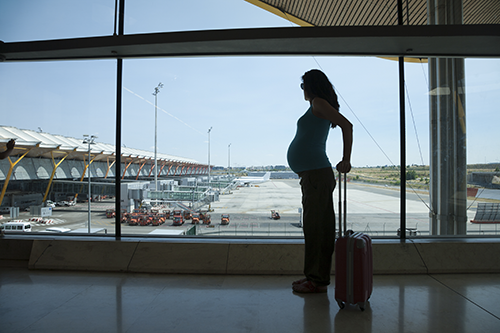 Once the first few Chinese or Russian or Turkish maternity tourists were denied passports the ACLU would file suit in San Francisco federal district court on their behalf, the court would enjoin the new policy, the Ninth Circuit would uphold the lower court, and the case would come before the Supreme Court. If Congress were to pass a new nationality law, clearly laying out what categories of people are covered by "subject to the jurisdiction", the response would be the same – lawsuit, injunction, appeal, SCOTUS. The problem is that Congress will never do that – it won't even pass a spending bill unless a deadline forces it to. That's why it's important for the executive to act, so as to set the process in motion. Constitutionalists rightly decry SCOTUS's evolution into a super-legislature, but settling this kind of dispute is the very reason we have a Supreme Court. But it can't settle a dispute until the dispute is brought to it. Whichever way the Court were to rule, the losers would argue that the case was badly decided – but at least it would be decided. Once that happened, the various parties could then consider the next move — maybe a new nationality law, if the Court rules in the president's favor, or a (quixotic, in my opinion) push for a constitutional amendment if the Court overturns the president's interpretation. I’m with Jonathan Turley on this: "the benefit of the order is that it could finally force the courts to resolve this question with clarity and finality." Since the four Democratic representatives justices on the Court would obviously vote to overturn any limitation on automatic birth citizenship, they'd need only one of the Republican justices to prevail (Roberts seems like the most likely candidate). But even that decision would be preferable to rhetorically plowing the same ground over and over again, with no political or legal effect. My own policy preference is to limit citizenship at birth to children with at least one citizen or permanent-resident parent, but with a kind of statute of limitations, conferring citizenship on others who were born here only if they live in the U.S. for the first 10 years of their lives (as Australia does) or upon completion of the eighth grade (as Yale law professor Peter Schuck suggests). But whatever one's policy preference, everyone should welcome a move by the president to clarify this issue. It's long overdue.